Sisymbrium Linn., Sp. Pl. 657. 1753. Gen. Pl. ed. 5: 296.1754; Schulz in Engler, Pflanzenr. 86(IV. 105): 46.1924; in Engl. & Prantl, l.c. 590; Vas. in Kom., l.c. 38; Hedge in Davis, l.c. 481; in Rech.f., l.c. 311. Annual, biennial or perennial herbs, usually subglabrous or sparsely hairy with simple hairs. Leaves mostly lyrate-pinnatipartite, lower petiolate; upper sessile to subsessile. Racemes many flowered, elongated in fruit. Flowers small or mediocre, mostly yellow; pedicels often spreading and ± thickened. Sepals erect, not or slightly saccate at base. Petals nearly twice as long as the sepals, oblong-obovate, narrowed into a claw. Stamens 6; filaments not appendaged but often broadened at base; anthers oblong, obtuse or subobtuse. Lateral nectar glands annular, quadrate or hexangular; middle glands joining the laterals, often torose or short stalk-like. Ovary linear-cylindrical, sessile, usually many ovuled; style short, thickened with depressed, ± 2-lobed, capitate stigma. Siliquae linear-subcylindrical, erect to spreading, often elongated, bilocular, dehiscent; valves ± convex and 3-veined, usually glabrous; septum hyaline, rarely subfun¬gose; seeds 1-seriate, usually many, oblong or ellipsoid, brown, not mucilaginous when wet; radicle mostly incumbent. Nearly 70 species, mostly in Temperate Zones; only 8 recorded from our area. Descurainia irio (Linn.) Webb & Berth. = Sisymbrium irio Linn. Erysimum officinale Linn. = Sisymbrium officinale (Linn.) scop. Norra altissima (Linn.) Britt. = Sisymbrium altissimum Linn. Pachypodium erysimoides (Desf.) Webb & Berth. = Sisymbrium erysimoides Desf. Sisymbrium columnae auct. non Jacq. = Sisymbrium brassiciforme C.A. Mey. Sisymbrium columnae var. orientale (Linn.) DC. = Sisymbrium orientale Linn. Sisymbrium columnae* = Sisymbrium orientale Linn. Sisymbrium daghestanicum Vas. 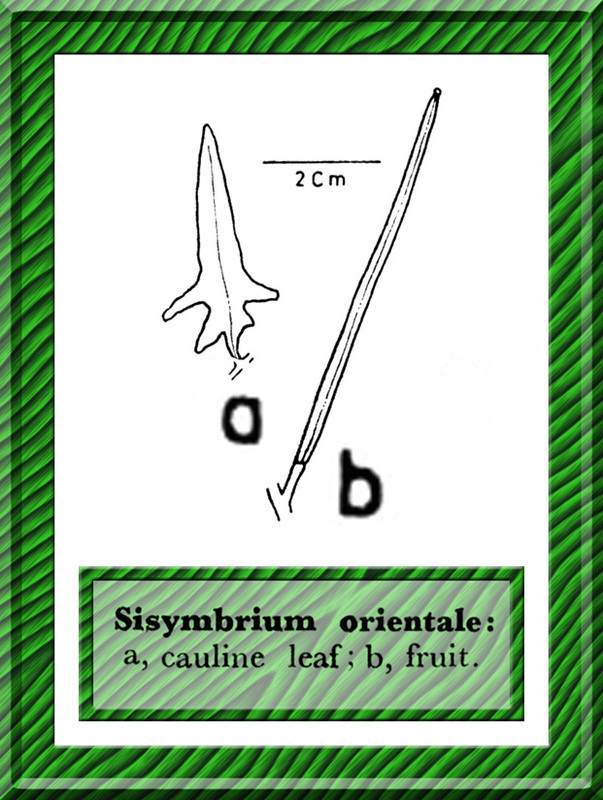 = Sisymbrium orientale Linn. Sisymbrium dahuricum Turcz. = Sisymbrium heteromallum C.A. Mey. Sisymbrium decipiens Bunge, Del. Sem. Hort. Dorpat. = Sisymbrium loeselii Linn. Sisymbrium ferganense Korsh. = Sisymbrium brassiciforme C.A. Mey. Sisymbrium glabratum O.E. Schulz = Sisymbrium loeselii Linn. Sisymbrium hastifolium Stapf = Sisymbrium loeselii Linn. Sisymbrium irio var. irioides (Boiss.) O.E. Schulz = Sisymbrium irio Linn. Sisymbrium irioides Boiss. = Sisymbrium irio Linn. Sisymbrium iscandericum Kom. = Sisymbrium brassiciforme C.A. Mey. Sisymbrium panonicum Jacq. = Sisymbrium altissimum Linn. Sisymbrium subhastatum auct. non Hornem. = Sisymbrium irio Linn. Sisymbrium zeae Spreng. = Sisymbrium erysimoides Desf.